We are upgrading our systems that handle authentication for our Library E-resources (online journals, eBooks, and databases) in order to provide increased security and a more streamlined user experience. Once signed into My Abertay you will be able to link directly to the full-text of a journal article, chapter of an eBook etc. from your LibrarySearch results or from the database itself without having to login again. 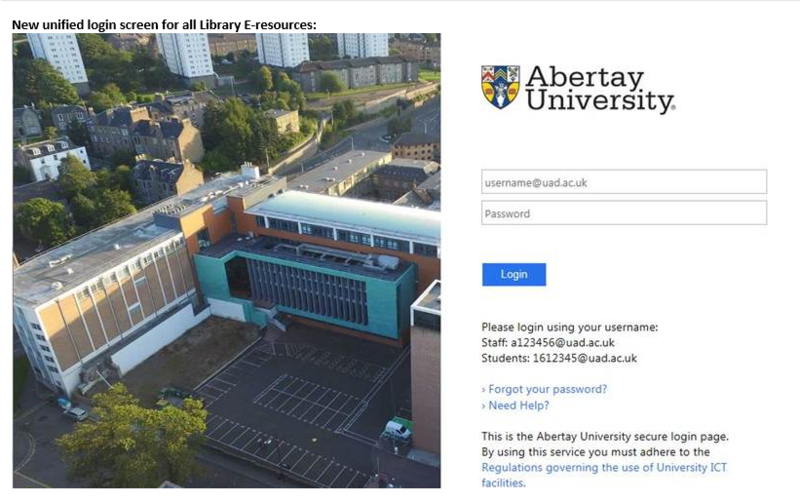 The current mix of login screens will be replaced with a single unified login screen for all Library resources and will use the standardised username format of “number@uad.ac.uk” (plus your Abertay network password) – see below for an image of this screen. Friday 23rd February 2018. Please note that we are not anticipating any disruption to Library E-resources when this is carried out. Will I have to make any changes? Due to the increased security measures, only modern, reasonably up-to-date devices and browsers are supported. If you are running dated browser and operating system combinations on your own device, you will now need to update them in order to allow continued access to our Library E-resources. What should I do if I encounter any issues? As we’ve now completed phase one of the £4m redevelopment of the Library building, we thought we’d take a look at what has been achieved and what is still to come. We think that levels 1 and 2 not only look amazing, but also have the mix of learning and social spaces required of a modern University Library. 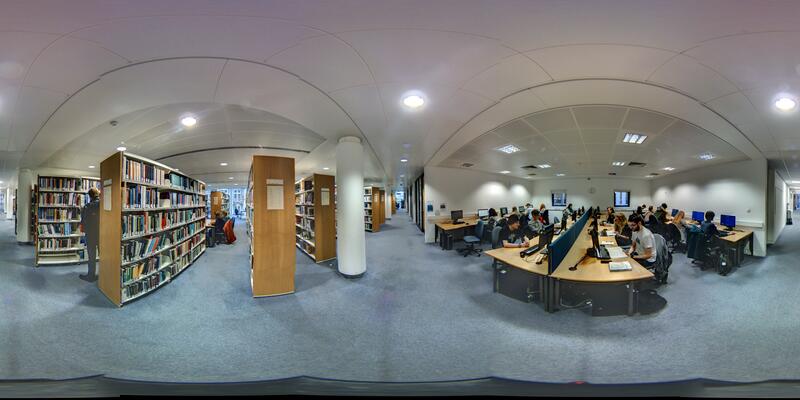 Our students are enjoying the results of the first phase of a £4 million state-of-the-art upgrade to the University’s Bernard King Library. The redevelopment will give our students among the best study facilities in the UK. The aim was to create a learning centre fully kitted out to utilise state-of-the-art, collaboration and learning facilities. Prior to the redevelopment, many of the fixtures and fittings were dated. There were also issues related to the control of temperature, light and ventilation, which often featured in student feedback. 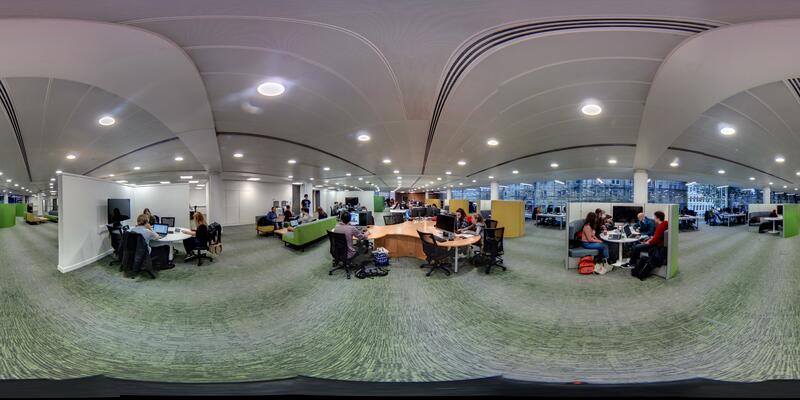 There has also been an increase in demand for spaces where collaborative and peer-to-peer learning can take place, involving greater levels of conversation and social interaction – an essential part of modern learning and this has been reflected in the new layout of the library. We are committed to providing a technology-rich learning and research environment for our students and staff. The first phase of the refurbishment took place over the summer of 2017, and re-opened for the return of students in September 2017. The project is a major investment in the education and welfare of students and staff, providing the very latest in interactive technology and support services. All four levels of the library, which is also open to the general public, will be completely refurbished, along with the plant room on level 5, in time for September 2018. The first phased focused on the redevelopment of levels 1 and 2. 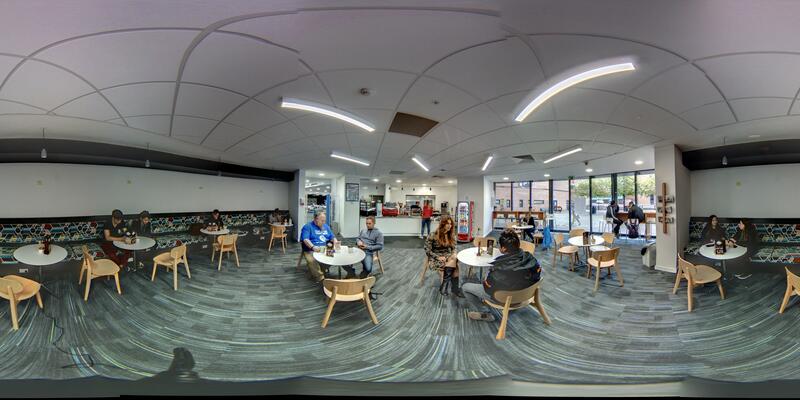 The upgrade includes a new café and extensive facilities aimed at the comfort and convenience of students and the staff who work in the building. More than £200,000 has been spent on new furniture for the library, while the interior design scheme is contemporary and incorporates the colours in our branding to create distinctive areas. 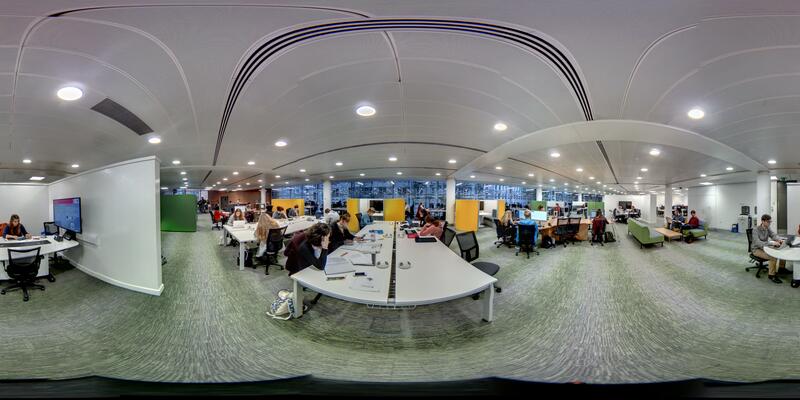 A new feature on Level 2 of the Library is a ‘creative design suite’ – a multi-purpose room somewhere between a ‘maker space’ and a ‘Google war room’. 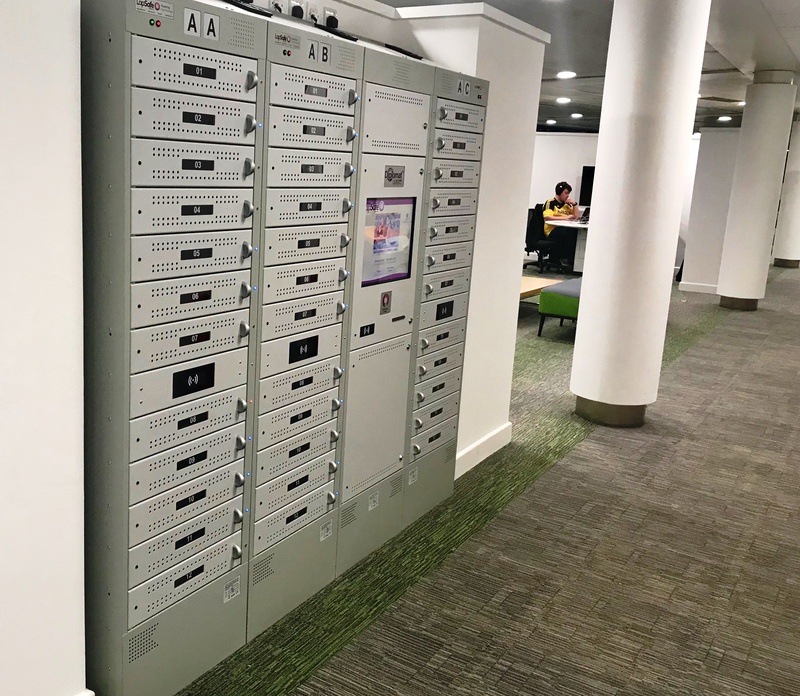 Laptop lockers and charging stations have been included in the concept, while the introduction of acoustic partitions and acoustically absorptive materials have been used strategically throughout the library to cut down on intrusive sound levels. Students and staff were consulted throughout the process via surveys, comment cards and focus groups. The University worked with a range of expert advisors and contractors: ADP, Pick Everard and Kier Construction. We love hearing your comments and suggestions. Please send any feedback on the Library redevelopment or services to library@abertay.ac.uk or leave us a message on the graffiti walls. We’re very excited for the planned changes to Levels 3 and 4 in 2018! As many of you may be aware, control of the temperature in the Library has been problematic in recent weeks, and this has become acute during this week’s cold snap. We have been working hard with the contractors to rectify the underlying cause, and in the meantime additional temporary heaters have been installed throughout the building. The contractors have reported that they expect to have the problems resolved by this afternoon (Friday, 10th November), with adjustments being made to the controls over the weekend as necessary. Thank you for your patience and apologies for any discomfort caused. If you have any comments regarding the Library Building, please contact us or leave feedback on the Graffiti Walls.